Cheyenne and Colin were married at Butterfly Gap Retreat in Maryville on Saturday and we had some great sunshine and warm enough weather to stay outside for quite a while. They were so focussed on each other that the natural moments were easy to catch- It seemed as if they didn't care if a camera was there or not, they just loved each other and enjoyed their day. I wish I could have gone to Hawaii with you Cheyenne \"/ - All my best to you both! Thank you! Thank you! Thank you! I can not even begin to tell you how thankful I am that you did my engagement and wedding photos. I wish I could put you in my pocket and take you everywhere to capture all of those memory moments. Colin has had to pry me away from the computer several times because I can't stop looking at them. I have had so many compliments from our wedding guests on how great you and Jenny were. 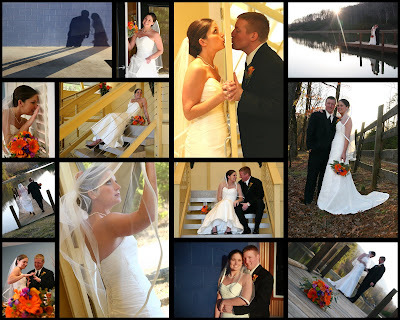 I received so many emails on how great our pictures were before I had a chance to tell anyone where to look for them. Little did I know, you put your card and website at each place setting so they can watch for them along with me and Colin. You truly do think of everything. Thank you so much!! !